I found immigration law quite by accident in 1976, the summer between my second and third years of law school. I responded to an ad for a part-time law clerk. The small law office was near school, paid well, and had nice support staff, so I took the job, barely knowing what the daily work would be. The field of immigration law was so small at that time that my law school only offered one, semester-long immigration law course every other year. It was not offered in the one year I had left before graduation. I have never taken an academic immigration law class, but rather learned my trade from generous practitioners who gave up their Saturdays once a month to teach free seminars to new practitioners. It was from that perspective that I developed a profound respect for immigration lawyers, so many of whom freely shared their knowledge in the hope of ensuring that quality legal services were offered to the immigrant community. For me, the daily practice of immigration law was akin to love at first sight. It was the perfect mix of frequent client contact with fascinating people from all walks of life and all socioeconomic backgrounds that made me feel as if I was travelling the world; and a combination of social work and complex legal puzzles that intellectually intrigued me. As I became immersed in the field, I became totally hooked by the compelling stories behind my cases, as well as the complicated legal strategies that many cases required. At the time I began my career, I did not understand why immigration lawyers were generally ranked only slightly above ambulance chasers. My experience allowed me to interact with brilliant lawyers dedicated to helping their clients, often with little acknowledgement and meager remuneration. When I began to practice and tried to explain the basics of immigration law to interested legal friends, it became clear to me that the statutory structure of this field of law was quite unique, but fairly sensibly built on general parameters of who would be a benefit to our country and thus should be allowed to find a way to legalize their status; and who were the bad actors who should not be allowed into the country or allowed to stay even if their initial entry had been legal. It struck a balance between family reunification and business and labor needs. There was even a category for industrious, pioneering individuals to come without sponsorship so long as they were able to support themselves financially. In short, it seemed to me to be a logical balance, with fair criteria to limit legal status to deserving, law-abiding people. Some of the hurdles that had to be overcome — for example, to test the labor market to protect US workers where one wanted to immigrate as an employee, or lengthy quotas that resulted in separation of families of lawful permanent residents (LPRs) — were clunky and cumbersome, but on the whole the system seemed to work fairly rationally. While some aspects were frustrating and individual immigration officers sometimes seemed inflexible or even a bit irrational, I do not remember the legal community who helped immigrants being tormented by draconian twists and turns in the law on a daily basis, which is how it has seemed lately. When someone was in deportation proceedings, there was the possibility of showing that, after having lived in the United States for more than seven years as a person of good moral character, if one’s deportation would cause oneself or a qualifying US citizen (or LPR) spouse, parent, or child extreme hardship, one could qualify for suspension of removal and eventual permanent resident status. There was also the possibility of qualifying for withholding of deportation if one was more likely than not to suffer persecution if returned to one’s homeland if one had fled a communist country or certain specified geographic areas. Yes, the preference quotas could be problematic, but all in all, it seemed to me at that time that most people who wanted to regularize their status could carve out a reasonably achievable path towards their goal, while the bad actors who were sent home deserved that fate. Every so often there were sad cases of nice people who could not find a category that allowed them to stay, but somehow it just did not seem as harsh a result for so many people as it does lately. The codification of the Refugee Act in 1980 ushered in a particularly exciting time. A large portion of my client base was from El Salvador, Guatemala, and Nicaragua, and the civil wars raging in the late 1970s were generating an influx of refugees. The stories I began to hear were exceedingly disturbing accounts of war and the cruelty which all too often accompanies it, but the horror was counterbalanced by the satisfaction of finding a way to protect people from further victimization by helping them secure safe haven in the United States. From an academic perspective, seeing how a statute evolved, through real-time interpretation and application, was a fascinating process — something many lawyers do not experience in their entire career. Then, to top it off, the Ninth Circuit set the stage to allow me to present oral argument in a case before the US Supreme Court in 1986. I am very proud that I, along with colleagues Kip Steinberg, Bill Hing, and Susan Lydon, were able to establish lasting precedent through our representation of Luz Marina Cardoza-Fonseca, making it clear that the use of the term “well-founded fear” was a significant change in the law and assuring that the adherence of the United States to the UN Protocol on Refugees was intended by Congress to guide our interpretation of US asylum law. Just as the briefs were being submitted, I learned that there was an opening for a judge at the immigration court in San Francisco, a location I had vowed never to leave. I struggled with the decision of whether or not to leave a practice with partners I truly loved, or to dive into a new adventure, in the hope that I could lead by example and prove that a former private practitioner could be viewed as an impartial and fair judge, respected by both the prosecution and defense bars. It was an exciting time at the immigration court because only a few years earlier, in 1983, the Executive Office for Immigration Review (EOIR) was created as a separate agency outside the Immigration and Naturalization Service (INS) as a component in the Department of Justice (DOJ). That step was a vital step forward, acknowledging the important distinction which must exist between the prosecutor and the judge in deportation hearings. I went for it and became a member of a corps of 68 immigration judges working for EOIR at that time. I found the transition to the bench challenging. There was far less interaction and discussion among peers as to how thorny legal issues might be resolved. In addition, because of the need to remain distant from the lawyers who appeared before me, I was much lonelier than I had been in private practice. While I found the interactions in the courtroom just as fascinating as in the first days of my legal career, there was a part of me that was unfulfilled. The stories I heard were riveting and the ability to resolve a conflict in a fair way extremely satisfying. However, I soon realized just how large a part advocacy played in my personality and path to personal satisfaction. This was quite a dilemma for a neutral arbiter who was determined to show the world that a former private practitioner could give both the government and the respondent a fair day in court! I searched to find an appropriate outlet for that aspect of my character, and the answer came in the form of my volunteer work for the National Association of Immigration Judges (NAIJ). The NAIJ was formed in 1979 as a professional association of immigration judges to promote independence and enhance the professionalism, dignity, and efficiency of the immigration courts. Through my membership and eventually leadership at NAIJ, I was able to help my colleagues as a traditional labor union steward, as well as to educate the public about the important role played by the immigration court and the reality which exists behind the cloak of obscurity the DOJ favors. Many people, lawyers included, are surprised to learn that the DOJ insists on categorizing immigration judges as attorney employees, which gives rise to a host of problems for both the parties and for judges themselves. While the creation of EOIR was a huge step forward, there was still considerable influence wielded by the INS. From courtrooms to management offices, ex parte communications occurred at all levels, and our relatively small system remained dwarfed by the behemoth immigration enforcement structure. My NAIJ colleagues and I worked hard to elevate the professionalism of our corps, to adhere to the American Bar Association (ABA) Model Code of Judicial Ethics, and to insulate our courts from political or ideological driven agendas, with the goal of assuring that all who appeared before us had a fair day in court. But we have always faced the headwinds of our classification as attorneys in an enforcement-oriented agency and the tension caused by enforcement goals that run counter to calm, dispassionate deliberation and decisional independence. Despite the creation of EOIR and its early promise that we would benefit from enhanced equality with those who enforced our nation’s immigration laws, we remained “legal Cinderellas,” mistreated stepchildren who seemed to be doomed to endless hard work without adequate resources or recognition for our efforts. From the time I became an immigration judge, we have never received the resources we needed in a timely or well-studied manner, but instead for decades we have played catch-up, had to make do with less, and have faced constant pressure to do our work faster with no loss of quality. Immigration judges scored a legislative victory when our lobbying efforts codified the position of immigration judge in the mid-1990s, and again in 2003 when we succeeded, quite against the odds, to remain outside the enforcement umbrella of the Department of Homeland Security (DHS) when it was created. Those accomplishments were quite sweet, but unfortunately, they did not go far enough — a fact predicted by my NAIJ colleagues and me. When I fast-forward to today, I see a substantive law which has spiraled out of control and a court system on the brink of implosion. The law has become so misshapen by unrelated, sometimes conflicting or overly repetitive congressional tweaks that it has become an almost unnavigable labyrinth, where many are lost on the way to their ultimate goal because of unanticipated interactions by the various incarnations of the statute. For example, the myriad criminal provisions interact illogically and conflict in ways that allow some clever lawyers to navigate a path for their clients, while pro se respondents become blocked from status with far less serious criminal histories because of an inability to parse nuances and wage creative legal battles. And many provisions of the statute would surprise, or even shock, members of the public. 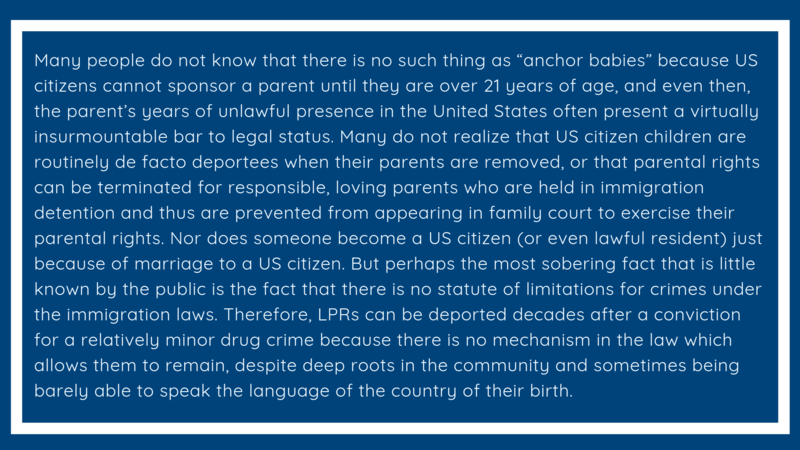 Many people do not know that there is no such thing as “anchor babies” because US citizens cannot sponsor a parent until they are over 21 years of age, and even then, the parent’s years of unlawful presence in the United States often present a virtually insurmountable bar to legal status. Many do not realize that US citizen children are routinely de facto deportees when their parents are removed, or that parental rights can be terminated for responsible, loving parents who are held in immigration detention and thus are prevented from appearing in family court to exercise their parental rights. Nor does someone become a US citizen (or even lawful resident) just because of marriage to a US citizen. But perhaps the most sobering fact that is little known by the public is the fact that there is no statute of limitations for crimes under the immigration laws. Therefore, LPRs can be deported decades after a conviction for a relatively minor drug crime because there is no mechanism in the law which allows them to remain, despite deep roots in the community and sometimes being barely able to speak the language of the country of their birth. I am deeply concerned that decisions on immigration legislation so often seem to be based on sound bites or knee-jerk reactions to individual horror stories rather than careful and unbiased analysis of documented facts and trends. I fear the public is deprived of the ability to form a well-reasoned opinion of what the law should provide because the rhetoric has become so heated and the facts so obscured. The immigration law has grown away from allowing decision-makers, especially immigration judges, to make carefully balanced decisions which weigh nuanced positive and negative considerations of someone’s situation. Instead, rigid, broad categories severely limit the ability of those of us who look an immigrant in the eye and see the courtroom filled with supporters from carefully tailoring a remedy, which can make our decisions inhumane and disproportionate. Such rigidity reflects poorly on our legacy as a country that welcomes immigrants and refugees and leads to results which can be cruel and not in the public’s interest. In the rush to reduce the backlog that was decades in the making, our immigration courts are once again in the hot seat, and individual judges are being intensely pressured to push cases through quickly. Immigration judges are placed in the untenable position of having to answer to their boss because of their classification as DOJ attorneys who risk loss of their jobs if they do not follow instructions, and yet we judges are the ones who are thrown under the bus (and rightfully so) if the corner we cut to satisfy that unrealistic production demand ends up adversely impacting due process. That pressure is intense and the delicate balance is one that often must be struck in an instant through a courtroom ruling — made all the more difficult because of the dire stakes in the cases before us. But, just to make it abundantly clear to immigration judges that productivity is paramount, last October our personnel evaluations were changed so that an immigration judge risks a less than satisfactory performance rating if s/he fails to complete 700 merits cases in a year. The DOJ’s focus and priority in making that change is not subtle at all, and the fact that our corps has recently expanded so fast that dozens, if not hundreds, of our current judges are still on probation, makes this shift an even more ominous threat to due process. The very integrity of the judicial process that the immigration courts are charged by statute to provide are compromised by actions such as this. Production quotas are anathema to dispassionate, case-by-case deliberation. One size does not fit all, and quantity can take a toll on quality. Perhaps most important, no judge should have his or her personal job security pitted against the due process concerns of the parties before them. I know I am not alone in feeling the weight that this constellation of circumstances of an out-of-date law and political pressure on immigration judges has created. All around me, I see frustration, disillusionment, and even despair among immigration law practitioners who are also suffering the consequences that the speed-up of adjudications places on their ability to prepare fully their cases to the highest standards. I see many colleagues leaving the bench with that same mix of emotions, a sad note upon which to end one’s career. Yet I can completely relate to the need to leave these pressures behind. I have witnessed several judges leave the bench prematurely after very short terms in office because they felt these constraints prevented them from being able to do the job they signed up to perform. It is supremely discouraging and, frankly, quite a challenge to remain behind in that climate. But as I write these reflections, I know I am not ready to leave quite yet. We must learn from history. We must do better for ourselves and the public we serve. Our American ideal of justice demands no less. When we canaries in the immigration courtrooms began to sing of our need for independence decades ago, we were seen as paranoid and accused of reacting to shadows in the mirrors of our cages. Finally now, we are seen as prescient by thousands of lawyers, judges, and legislators across the country, as reflected by proposals by the ABA, Federal Bar Association, National Association of Women Judges, Appleseed Foundation, and American Immigration Lawyers Association. There are signs that these calls are being heeded by lawmakers, although the legislative process seems both glacial and mercurial at best. The creation of an Article I Immigration Court is no longer a fringe view, but rather the solution to the persistent diminution of essential safeguards our system must have, clearly acknowledged by experts and stakeholders alike. See INS v. Cardoza-Fonseca, 480 US 421 (1987). DISCLAIMER: The author is President Emeritus of the National Association of Immigration Judges and a sitting judge in San Francisco, California. The views expressed here do not necessarily represent the official position of the US Department of Justice, the Attorney General, or the Executive Office for Immigration Review. The views represent the author’s personal opinions, which were formed after extensive consultation with the membership of NAIJ.